Selling health & medical equipment to be used by the individual health practitioner who makes house calls or is working in a clinic or medical office. These products are essential to every individual practitioner and can allow you to acquire all information needed to perform a full physica exam. 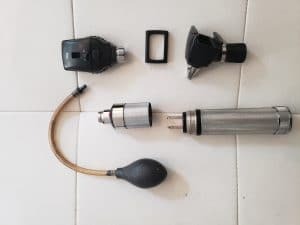 Diagnostic Set of Standard Ophthalmoscope and Pneumatic Otoscope with NiCd Handle used by health practitioners for eye and ear medical diagnosis of disease. I am a physician who practices both emergency and functional medicine in many states on the east coast.